This post is the second of a three part series on the new American Boat & Yacht Council consolidated warnings for recreational boats. We announced the new labels in May 2015 in part 1, our post titled, ABYC Releases Consolidated Boat Warning Labels. Note – much of our story of the development of ABYC’s consolidated warnings rides upon work by others. Two sets of consultants plus Professional Boat Builder magazine each have published a history of a segment of their development. USCG’s National Boating Safety Advisory Council meeting minutes also provide a portion of the history. This posts identifies and pulls those previous documents together to provide a broader overview of the project. In the mid to late 1990s, a similar project was undertaken to combine / consolidate warnings on personal watercraft (PWCs). Consultants were hired to identify hazards and develop two warning labels (one for collision avoidance and one for general operational hazards). In general the purpose was to develop consolidated labels for the PWC industry vs having separate warnings for each hazard from each manufacturer. Coast Guard accident Boating Accident Report Database (BARD) accident reports were analyzed and manufacturers were consulted to make sure warnings covered the appropriate hazards and issues. Revisions of labeling for personal watercraft: Part 1 – label development. Injury Control and Safety Promotion. Vol.8. No.2. (2001). pgs.71-81. Revisions of labeling for personal watercraft: Part 2 – label evaluation. Injury Control and Safety Promotion. Vol.8. No.4. (2001). pgs.211-227. Final designs were presented to the Coast Guard in July 1999 for review. No changes were made. Now we flash forward to the carbon monoxide issues in houseboats raised by Double Angels. In 2000, two young boys were killed by carbon monoxide poisoning behind a houseboat on Lake Powell. Their parents created a victim advocacy organization (Double Angels) calling attention to the issue that same year. Double Angels was able to bring the issue to the forefront and determine there large numbers of similar incidents that previously went unnoticed (were attributed as drownings, not carbon monoxide poisoning). The Coast Guard, the Environmental Protection Agency (EPA) and many other players became involved. In 2005 the State of California hired Design Research Engineering (DRE). a firm often used by the industry in defense of lawsuits, to develop a carbon monoxide warning for boats. Professional Boating Building magazine says it took DRE 2.5 years to develop the label. Our understanding is that warning is the origins of ABYC’s Carbon Monoxide warning label currently sold by National Marine Manufacturers Association (NMMA) and required on NMMA certified boats. Boating Industry Risk Management Council (BIRMC) reported to National Boating Safety Advisory Council (NBSAC 85) in April 2010 that Design Research Engineering had reported on their development of the carbon monoxide warning at the last BIRMC meeting and that label is now (2010) in use by NMMA. (see page 16 of NBSAC 85 minutes). BIRMC then announced their next focus would be on boat warnings. BIRMC has launched a project to combine boat warnings similar to the PWC combined warning and Design Research Engineering (DRE) has been contracted to work on the project. ABYC and NMMA were also participants in development of the carbon monoxide warning. BIRMC is part of NMMA. ABYC was involved in creating standards requiring use of the warnings and may have administered a USCG contract aiding in development of the carbon monoxide warnings. USCG Boating Safety Circular 86 (August 2008) presents the ABYC / NMMA carbon monoxide warnings. Fair Warnings. Rovings”, Dan Spurr. Professional Boatbuilder. No. 156. August/September 2015. 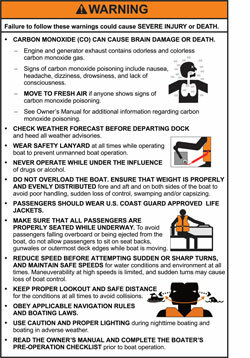 American Boat and Yacht Council Warning Label Grant Report. Prepared by Design Research Engineering. Robert K. Taylor and Wendy C. Sanders. Prepared for ABYC. 23 December 2014. The report is available for free from ABYC, but you have to go through some steps to download it. This post is one of several posts on the ABYC Consolidated Warnings. Links to all the posts are supplied below.